Recent research on Parkinson’s Disease (PD) and the gut biome suggests researchers may have been barking up the wrong tree. PD appears to be associated with dysbiosis or the ill health of your gut microbiome, not just the brain as was once thought. PD has a “strong environmental component.”(1) Does this mean that what we breathe, drink, and eat can seriously affect our health depending on what genes we have? That’s the new line of thinking called epigenetics. The article mentions exposure to pesticides, but does not mention a word about gluten, and of course there are numerous other toxins in our environment. Gluten can be the root cause to over 300 symptoms and disorders/diseases that are well substantiated by over 19,000 world studies. Among them are anxiety, mood disorders, depression, headaches/migraines, schizophrenia, autism, ADHD, tics, muscular issues, and many more neurological issues that can be linked to celiac disease, a malabsorption issue. Many of these neuro-disorders can disappear or get miles better once the trigger, gluten, and perhaps dairy and other proteins are detected and removed from the diet and the gut has a chance to heal. It’s interesting to note that PD patients may also have constipation (a common symptom of celiac) and other gut symptoms years before the PD symptoms first appear. Although “they” say there is “no cure” and no “preventative” measures perhaps researchers have not looked hard enough at gluten intolerance and celiac disease and thorough enough testing to detect intolerance. It would be intriguing to know how many newly diagnosed PD, ALS, or Alzheimer’s patients tested positive for gluten intolerance/celiac disease if given the extent of testing presented in my book, Toxic Staple. Too many patients are only given one test; it’s not enough in most cases. To discover more research on PD and neurological issues related to gluten read Chapter 9: Neurological Dilemmas: The Mind-blowing Hazards of Gluten (the longest chapter in the book). Cell Press. “Gut microbes promote motor deficits in a mouse model of Parkinson’s disease.” ScienceDaily. ScienceDaily, 1 December 2016. www.sciencedaily.com/releases/2016/12/161201122159.htm . As we approach this Thanksgiving Day and holiday season many of us think a little more about giving thanks for all that we cherish: our family and friends, our freedom, and our good health, among many others. I especially am thankful everyday for the excellent health my family and I enjoy. Had we not discovered we were all quite intolerant to gluten we would not have been such happy campers these last 12 years. Knowing what I know about the devastating and degenerative hazards of gluten from having poured a decade into research and writing my award-winning book, “Toxic Staple” I can’t imagine what shape my family and I would be in if we hadn’t figured this monster out. I am fortunate to only be on one med for a hypothyroid that was very likely damaged due to gluten (autoimmune diseases are highly linked to gluten) before I even knew what gluten was, and I never get sick, and have great energy. Many of you, however, do not bask in the sunlight of good health and great energy and may not realize that much of your poor state of health lies in your own hands. Most of you really can do something about your allergies, asthma, fatigue, autoimmune diseases, skin issues, neurological maladies, and on and on, if you want to. Naturally everything is not linked to gluten, but truly, it is incredible what gets better when you address this “toxic staple” that pervades our everyday lives and destroys your gut and other parts of the body. Going downhill at the rate I was traveling prior to “the gluten-free lifestyle” in my early sixties, I can only assume that my longevity has been extended vastly, along with greater health, and rejuvenated energy and vitality. I encourage you to look at your health and that of your children and other family members and friends. Many of you think it is normal to have intestinal issues, fatigue, allergies, asthma, arthritis, organ issues, migraines, depression, and on and on for more than over 300 maladies linked to gluten, but it is not. Older age does not necessarily have to mean degenerative, failing health. Your health and life can become so much more enhanced and transformed that you would not believe it. I am in better shape in my seventies than when I was in my forties. No kidding! All I did was remove the “monster” gluten (dairy also bothers many who are gluten intolerant). By the end of the first year I was only going for health checkups instead of sick calls. But let me warn you that the vast majority of our traditionally trained doctors are not giving enough testing to track down celiac disease or gluten intolerance, nor are they aware of the numerous symptoms and illnesses linked to gluten. It’s not really their fault. Little is being done to educate every health care professional in every facet of medicine, since gluten can affect any part of the body, and many think celiac and gluten issues are rare. They are epidemic! If you are plagued with chronic symptoms and illness please…do your body and brain a favor… you must become your own advocate in conjunction with your doctor. Get educated, get tested (you will need to request certain tests), and if positive follow a 100% gluten-free lifestyle. No cheating! And give mega thanks you have discovered the root of your health problems. Please read the disclaimer above. Please get back to me with your success story at anne(@sign)toxicstaple.com and kindly share this info with all your sick and tired friends who may be misdiagnosed, undiagnosed, or overdosed! Even some of those who have rare and incurable diseases may find life can improve without gluten. What sad news about the talented and respected actor and comedian, Robin Williams, who has brought so much entertainment and so many laughs to the American public. Not a day goes by that I don’t hear some awful news on TV, radio, or among friends and acquaintances that could be the result of gluten ingestion. Having read over two thousand abstracts and studies on the hazards of gluten consumption, I wonder if he and many others with debilitating illness might have been tested for gluten sensitivity. Did you know that depression is a common symptom in those diagnosed with celiac disease. Many other neuro/cerebral symptoms/diseases and associated conditions, some of them very degenerative, are linked to gluten through numerous studies from around the world. Celiac disease slowly destroys the ability of the intestinal wall to absorb the nutrients vital for good health. It stands to reason that if one is mal-absorbing due to damaged villi it could affect your brain and neurons. After all, in order to be healthy the brain and neurons need certain vitamins and minerals. 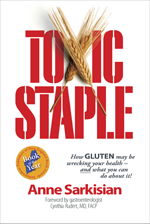 The longest chapter in my new book, TOXIC STAPLE: How GLUTEN may be wrecking your health – and what you can do about it! is entitled Neurological Dilemmas: The Mind-blowing Hazards of Gluten. If you or your child are suffering from ANY neurological health issues (or any other chronic health issues) please checkout more info above on this website for the lowdown on my book. It offers health and life-transforming information. Neurological maladies are nothing to play with and often get worse over time. PLEASE get tested for gluten sensitivity, and if positive take the gluten-free lifestyle very seriously. You will need to request certain tests or it’s very likely you won’t get adequate testing to detect an intolerance.